Five wickets for Joe Fairbrother helped Miltob Keynes pick up maximum points against Printers to keep the pressure on Four Counties Division 1 leaders Thurleigh. Their comprehensive 123-run victory saw them reduce the gap by a full 30 points, and it now stands at just three with just handful of games remaining. 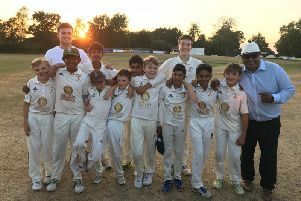 While the pace-setters didn't play this weekend, MK had a great chance to close the gap when they took on relegation strugglers Printers, and the home side got off to a great start, putting on 62 for the opening wicket. While the top three all scored big runs - 30 apiece for Nimesh Chavda and Neil Gordon, and Sam Hagger hit 57 - there was little in the way of high scoring down the order. But MK saw out their innings to reach 208-8. Puran Paran was the pick of the bowlers for Printers, taking 3-42. With the title hanging in the balance, MK knew every point will be essential in the run in, so they wasted no time in rattling through the Printers order. Brian Tompkins (2-20) and Fairbrother did the damage at the top of the order, with the latter going on to take 5-30 as he proceeded to tear through the visitors. Chavda took 2-4 at the end to mop up the tail, and with just three batsmen in double figures, Printers were reduced for just 85. While MK move within three points of Thurleigh, the result leaves Printers 34 points from safety, trailing New City, who in turn pulled off a shock result to put distance between themselves and the bottom two. Taking on reigning champions Eaton Bray, who have hit the self-destruct button since their chances of retaining their Division 1 crown were lost, New City were in rampant form with the ball, bowling out the visitors for just 51. And despite losing five wickets, New City cruised to 52-5 inside 14 overs to take 25 points. Runs proved hard to come by when North Crawley took on Elstow at the Recreation Ground, but Matt Goss' side climbed to fourth with a four wicket win over the third placed team. It would be a long first innings as Elstow took it the full distance, but only scored 139-8. North Crawley's reply was just as much of a grind too, but thanks to John Collings' unbeaten 57, they made it to 140-5 in 42 overs to claim victory and leap Eaton Bray into fourth spot. The battle for midtable supremacy between New Bradwell (202-7) and MK City (205-8) saw City take the spoils.